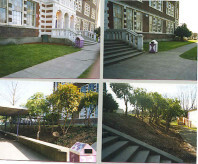 This project site was located along the stairways leading to the main entrance to Garfield. 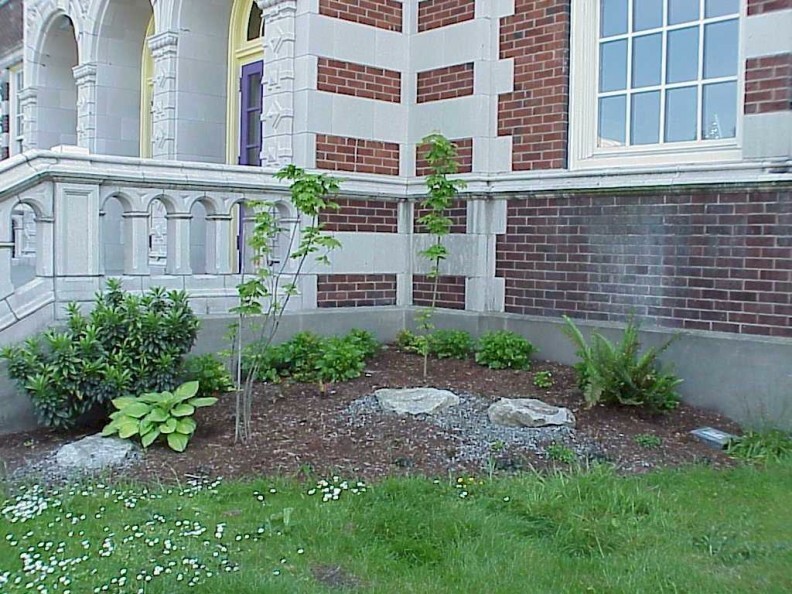 Our site was designed to be a woodland garden, planted primarily with Pacific Northwest natives that could tolerate the cool, shady site and complement existing vegetation. To prepare this site, we first cleared the soil along the stairs of ivy roots, horsetail, old stumps, and rat nests. We then installed root barriers running parallel to the lower stairs to prevent reinfestation by ivy and horsetail. Near the upper stairs, we built triangular planting beds to create spatial diversity and provide a vertical transition between the flat ground plane and the tall building. Once the site was prepared, our group installed boulders on gravel bases (to prevent rats from nesting underneath) along with new ornamental plantings. Our landscape was finished by adding a thick layer of wood chips to prevent weed seed germination and increase moisture retention in the soil. This project site is a small triangular green space located on the southeast side of Garfield. Since the site is adjacent to a playfield, the main delivery driveway, and a bus stop, it receives a steady flow of foot traffic and had heavily compacted soil. Our design called for creating planting mounds around the three existing trees, leaving existing social paths, and installing large boulders for visitors to sit on. To prepare this site, we first dug a trench around the site’s perimeter to help retain added mulch materials. Our group then removed as much of the existing turf and weeds as possible, mowing the portions that couldn’t be easily removed; the entire site was then covered with a thick layer of wood chip mulch. We also pruned the existing shrubs (Cotoneaster) and assessed the hazard potential of the existing trees. 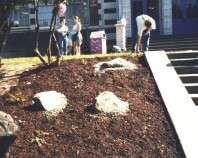 Once the site was prepared, we added boulders on gravel bases along with new ornamental plantings. We then created bermed planting islands around the trees, installing plants that could survive the heavy traffic and harsh conditions of the site. 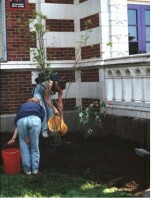 The landscape was finished by adding another layer of wood chips to prevent or alleviate soil compaction and weed seed germination, and to increase soil moisture retention.